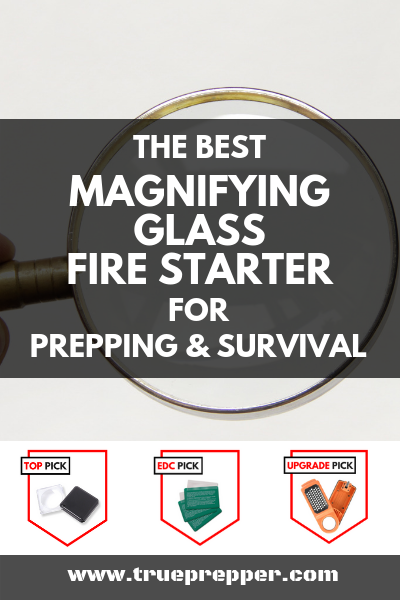 A good magnifying glass fire starter is a huge upgrade for a variety of survival kits. Sure, being able to start a fire with nothing but a lens is pretty darn cool, but there are also several advantages to having a magnifying glass handy. For starters, they are not consumable (meaning they don’t get used up, like matches, lighters, or ferro rods) and they are extremely versatile. The best magnifying glass fire starter is versatile, functional, but most importantly: durable. We have conducted hundreds of hours of research and testing on magnifying glass fire starters, searching to find the best ones for value, functionality, your budget, and portability. If you want to always be able to start a fire with a lens, one of our magnifying glass recommendations will do the job. What is a Magnifying Glass Fire Starter? Who Needs a Magnifying Glass Fire Starter? The magnifying glass that provided the best functionality, versatility, durability, and value. Withstands punishment with the built in durable case. 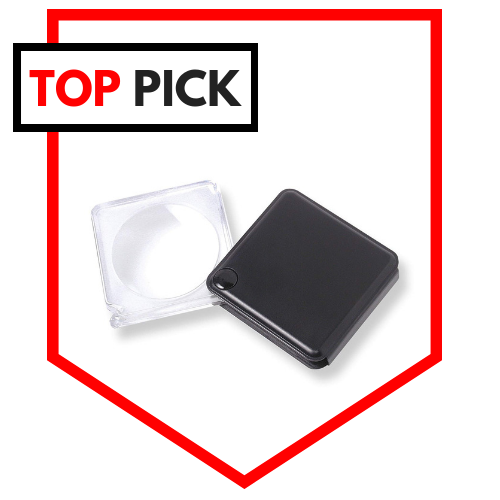 The Carson MagniFlip 3X Pocket Magnifier is a small, lightweight magnifying glass solution designed to be durable enough for everyday use. With a 1.6″ diameter lens, it is just the right size to easily get a small focal point for fire starting. The 3X magnification helps put the focal distance not to far or close from the lens itself. The lens itself is constructed from impact resistant optical plastic, which means you don’t have to worry about it breaking. This also makes it incredibly lightweight (1.6 ounces), even with the attached protective case. 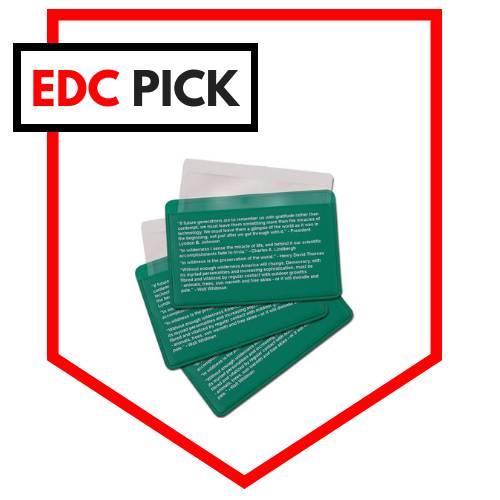 All of these features make it an excellent choice for BOBs, GHBs, and standard survival kits. Incredibly thin. Ridiculously lightweight. Sold in packs of 3. The Best Glide Credit Card Fresnel Lens is a marvel. If you don’t have one already, you are missing out. Fresnel lenses are so thin (0.4 millimeters) that you can store one pretty much anywhere- not just your wallet. Stash some in your survival books, playing cards, auto repair manual- you can keep a powerful magnifying glass in all of these. If you do keep one in your wallet, you won’t notice it because it only weighs 5 grams. Best of all, they are darn tough and durable. You won’t have to worry about breaking your glass magnifying lens since they are made of razor thin flexible polymer. Best Glide prints some survival quotes on the protective sleeves, and three of them come in a pack. This tinder box includes a magnifying glass, mirror, tinder cutter, and storage container. The Gerber Bear Grylls Tinder Box is a whole lot of versatility packed into one tool. 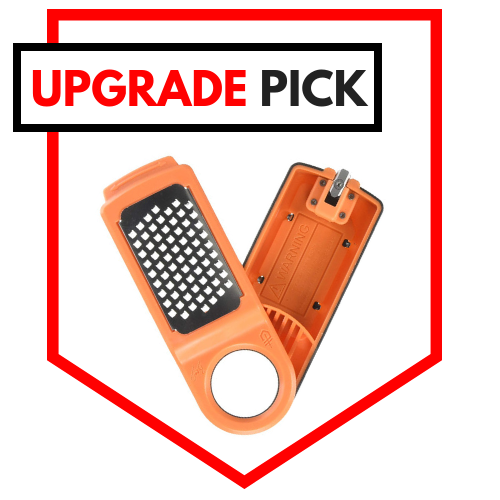 The tinder shaver and storage container can save you countless hours of feathering wood and will keep the tinder you collect dry. The mirror is useful for signaling, and the magnifying glass is, of course, used to start fires. It runs a little bigger than our other options, but that is obviously due to additional tools and versatility. We’ve reviewed Bear Gryll’s gear before and found that some of the branded equipment is a good deal. The tinder box is no exception, and is reviewed well by those that have actually used it. A magnifying glass is a convex lens made from transparent material. Usually, magnifying glasses are used to magnify images although they can magnify other things as well: namely, energy. A magnifying glass fire starter is a magnifying glass that harnesses solar energy to light a fire. Both the diameter and the focal length are important, since they must be a close in order to effectively pinpoint this energy in a way that is useful for fire starting. The type of magnifying glass is important, since it rules out what can and can’t start a fire. For instance, if you are nearsighted, your glasses cannot help you start a fire since they will disperse the energy. If you are farsighted, however, then you are in luck. You could use your glasses in a pinch to focus the suns energy to a point and start a fire. If you have a low prescription, it may be more difficult though since your focal length will be pretty far away from the glasses and hard to hold steady. Despite these drawbacks, a plastic lens is superior in a survival setting simply because it is less likely to break. A scratched lens is much easier to work with than a broken one. Plastic magnifying glasses are usually lighter weight, which can help when packing a bug out bag since every ounce can matter. The durability of a well-made polymer magnifying glass pushes it ahead of glass almost every time. Weather – In order to start a fire with the sun, you need to harness solar energy with the sun in the sky. Cloud cover or rain will prevent this. Tinder – Bad tinder can ruin your chances of starting a fire before you even start. Make sure you have good, feathered, dry tinder. Magnifying Glass – We talked about how you can start a fire with many different things that magnify, but some materials are easier than others. Using ice to start a fire may be possible, but it is extremely difficult to do. 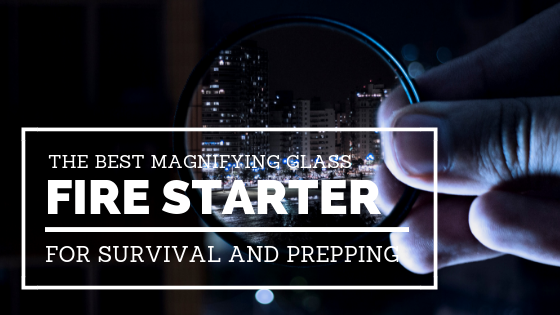 Training – Learning the focal distance of your magnifying glass and how to focus the energy into a point may seem like common sense, but without practice you may find it harder to accomplish in a survival scenario. You’ll notice in the video that she goes for the char-cloth for tinder, which is very forgiving and takes much less time to ignite. Even with the perfect conditions that we laid out above, one of the most important things you need to keep in mind is patience. A magnifying glass fire requires a steady hand, attention to detail, and plenty of time. Everyone should be familiar with these kits, and have a disaster survival kit at the very least. Solar power, while not always reliable, is incredibly powerful. If the sun is out and you need to get a fire going- you can easily harness the energy to do so with just a small tool. A magnifying glass is an elegant solution. There are no moving parts to break. It doesn’t need electricity. Best of all: magnifying glasses are not consumable. Using a magnifying glass to start a fire doesn’t leave you with any less potential to start a fire the next time. Matches, lighters, and even ferro rods eventually run out of strikes. Magnifying glasses are versatile. You can use a magnifying glass to signal with pinpointed light. You can use it to see smaller objects and far away objects better. Magnifying glasses are often used with detailed maps. Some people even need them to see clearly, since they are the lenses in glasses. If that doesn’t get you excited about the potential of starting fires with a magnifying glass, I don’t know what will. As he demonstrates, your imagination is the limit when it comes to harnessing solar energy with lenses. Essilor News. (2018). Missed Boy Scouts? No Problem. Learn How to Use Your Glasses to Start a Fire. Essilor USA. Retrieved from essilorusa.com. Slyusarev, G.G. (1962). On the Possible and Inpossible in Optics. Armed Services Technical Information (Translated, Unclassified AD 284847) . Retrieved from Defense Technical Information Center. Magnifying glasses have been around since before 400 BC, and some of the earliest uses were to start fires. It may be old technology, but it is a great tool to include in any survival kit. There are quite a few magnifying glasses out there, and we hope that we have helped you narrow them down to your specific need. Everyone has a different situation, so the best magnifying glass for you may be slightly different than what we have reviewed and tested. Be sure to get familiar with the magnifying glass you go with and practice using it so you can get used to the focal length.